Acid reflux, the bane of countless millions of people worldwide, may well be a normal physiological event in yearling horses, Australian research suggests. The researchers from Charles Sturt University and the Graham Centre for Agricultural Innovation were led to conclude that gastro-oesophageal reflux occurred in clinically normal yearling horses. 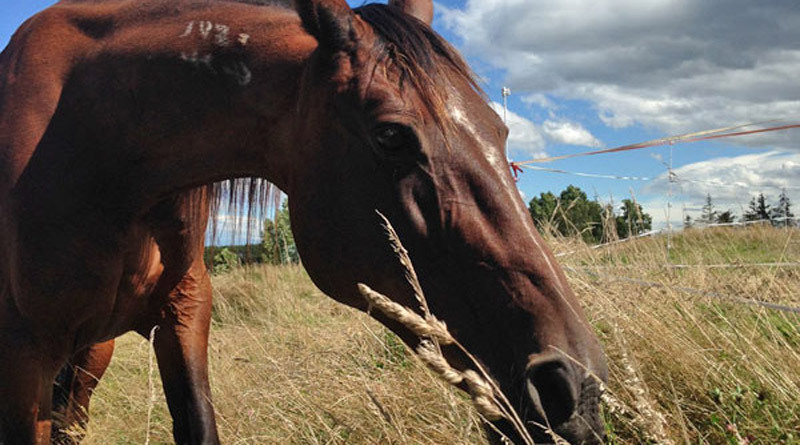 Their findings have been reported in the Equine Veterinary Journal. Cara Wilson and her colleagues said arytenoid chondritis – a condition that causes swelling and ulceration in the cartilage in the larynx – can be caused in people by chemical trauma resulting from acid reflux. Although a similar process may be involved in the development of arytenoid chondritis in horses, pH levels around the oesophageal region were poorly understood, they said. The study team set out to determine whether gastro-oesophageal reflux occurred in horses in a blinded, randomised, placebo-controlled, crossover experiment involving six yearlings. The research involved measuring and recording oesophageal pH in the yearlings over four 24-hour periods using a pH recorder attached to a catheter with two sensing electrodes inserted into the oesophagus. One of electrodes was well down the oesophagus, the other higher up. The young horses were initially grazed in a paddock, then moved to stables to simulate the sales preparation of thoroughbred yearlings. When stabled, they were given either omeprazole – a drug commonly used to control acid reflux in humans and gastric pH in horses – or a placebo paste by mouth once a day. Recorded pH levels ranged from 4.90 to 9.70 and varied frequently, the researchers reported. The average pH recorded by the upper sensor was 7.36, while the lower sensor recorded an average of 7.18. They found that pH levels tended to fall after the consumption of concentrated feed (the greatest falls in pH were seen two to six hours after a meal of concentrate). Lower pH was also found to be more likely in the afternoon and early evening. The type of activity also impacted on the pH, for example higher pH levels were associated with hand walking of the horses. “It is possible that the high head position during hand-walking may limit the extent of gastro-oesophageal reflux,” they said. The study team found that treatment with omeprazole had no detectable effect on pH levels. This, they said, was no surprise, given that the pH levels recorded during the study fell outside the drug’s therapeutic range in humans. They said the influence of these management factors were small, suggesting there were other sources of the major variation seen, which might include temperament or other management factors not assessed as part of the study. The study team said their key findings were the rapid changes in oesophageal pH measurements and the significantly lower pH levels at the lower sensor after meals and during afternoon periods. Conversely, high pH measurements recorded by the upper electrode were consistent with the swallowing of alkaline oral secretions. Wilson was joined in the research by Victoria Brookes, Kristopher Hughes, Gareth Trope, Heather Ip and Allan Gunn. C.S. Wilson, V.J. Brookes, K.J. Hughes, G.D. Trope, H. Ip, A.J. Gunn. One common cause of acid reflux disease is a stomach abnormality called a hiatal hernia . This occurs when the upper part of the stomach and LES move above the diaphragm, a muscle that separates your stomach from your chest. Normally, the diaphragm helps keep acid in our stomach. But if you have a hiatal hernia , acid can move up into your esophagus and cause symptoms of acid reflux disease.